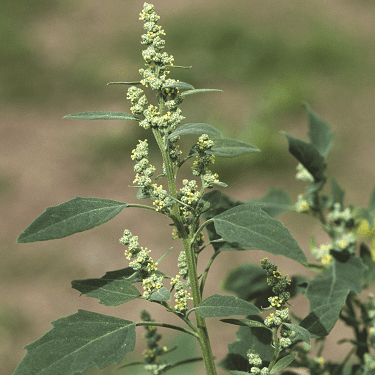 Fat Hen is a polygonum weed that grows in the spring & summer that it is often found on waste and cultivated land, it can be found in many parts of the UK. It can be found in sandy and clayey areas and not associated with Calcareous soils or gravel. It can grow best when it is on fertile soil it is also known to be a weed that is hard to control. If left untreated it can grow to 2-3-foot-high and disperse thousands of seeds. It can cause issues within crops and often new sowings of grass can be swarmed with this weed through the spring. Fat Hen can be variable in looks depending on its growth stage, but it is a medium to tall mealyplant, the leaves can be variable and also, they can be lanceolate shaped to diamond shaped and there can be tiny green flowers. Though it is time consuming, hand weeding or hoeing beds and borders can be the best way to control this weed. However, if you have this weed in a ‘bare area’ then we would recommend a treatment of ‘Diamond’ which will control all other weeds and grasses. If you have this weed within grassland, we would recommend looking at ‘Thrust’ which is safe to the grass. If you have this problem within a lawn, we would recommend looking at ‘Enforcer’. For control around Trees & Ornamentals consider looking at Flexidor.